Today's mission wasn't just any theft. It had been ordered by Kanrik himself. And no one dared to flee a mission ordered by the head of Thieves Guild. 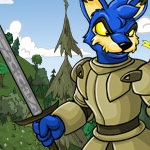 With thousands of books to choose from, it may be difficult deciphering which books will best help your Neopets become educated.